Bullet’s newest tournament-style bassin’ wagon puts owners on the fast track to catching more fish. There are two kinds of fishing holes during a tournament: the one you are fishing on and the one someone else is fishing because he got there first. And that’s where the 21SDC comes in, but there’s one big downside. If you lose the tournament, you won’t be able to blame the boat. Bullet is essentially a custom builder that marches to its own beat. It is one of only 6 percent of U.S. manufacturers that don’t belong to the National Marine Manufacturing Association’s (NMMA) certification program, so its boats won’t display a yellow plate that shows maximum passengers, weight or even max horsepower. It does abide by Coast Guard regulations, though, and those say that a boat more than 20 feet long isn’t subject to the aforementioned restrictions. In other words, Bullet don’t need no badges. The DC in the 21SDC’s name stands for dual console, and the co-angler will enjoy having the same protection as the primary. 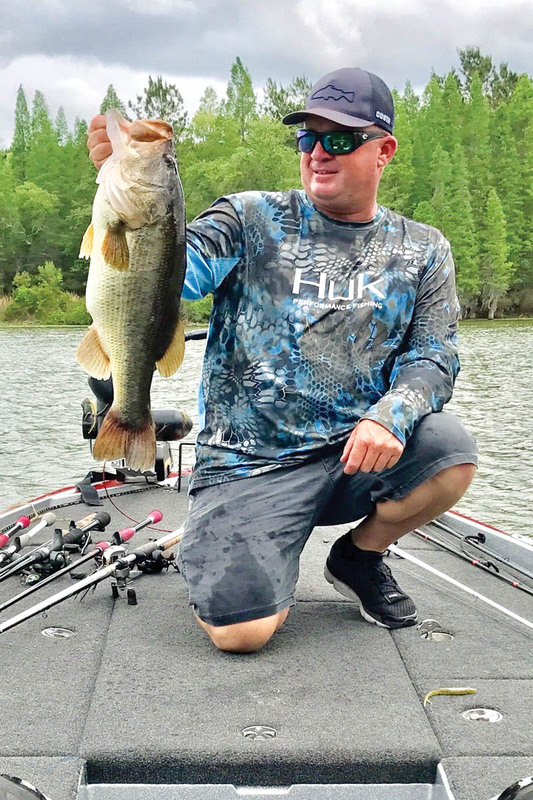 This might be the first tournament bass boat I’ve tested where the co-angler has nearly as much square footage on the rear casting deck as the primary has up front, largely because of its narrow bow profile. 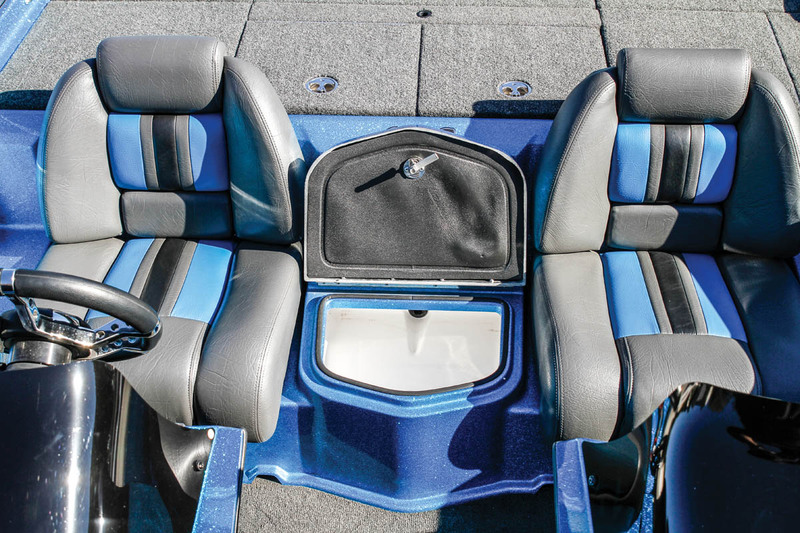 The 21SDC bucks the modern trend of bass boats having a tall dash that can accommodate flush-mounted big-screen electronics. Same goes for the bow section. But there is an optional bracket, so owners can mount a display on top of the dash without having to look at it through the wheel. Bullet offers either a Humminbird Helix 9 with a bracket for $2,000 or the 12-inch model for $3,000. The dominating design elements of the 21SDC are its narrow profile and light weight. Everything on this boat is designed to maximize its speed. 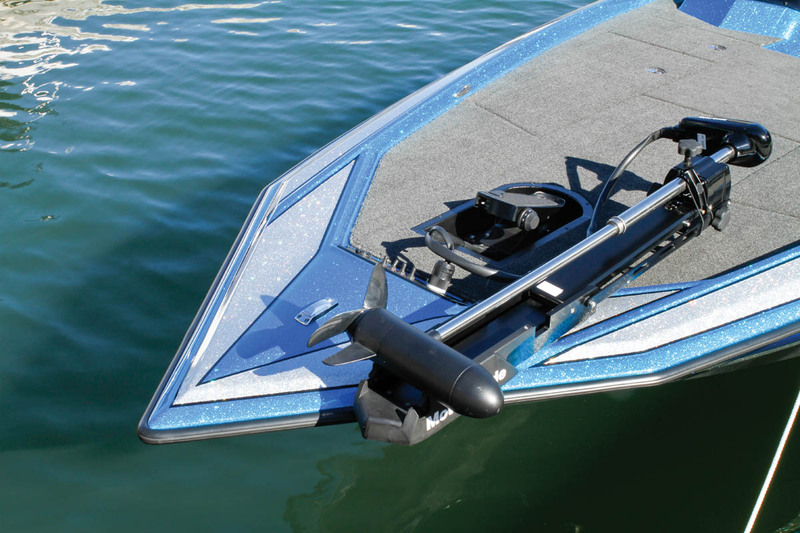 With a 91-inch beam, it’s five inches narrower than the Ranger Z21 at its widest, and even more so in the bow section, and at 1,380 pounds it’s 570 pounds lighter, which translates to higher speed. With a direct-injected two-stroke Mercury OptiMax 250 Pro XS, it reached a blazing 82.1 mph. When I tromped the standard Hot Foot throttle, it exhibited surprisingly little bowrise during its holeshot as it reached plane in just 2.7 seconds. It took a beat for the OptiMax’s prop to hook up, but when it did, the boat accelerated hard and clocked 7.2 seconds from zero to 30 mph. A good call is the standard trim stalk right at the wheel, so the driver can keep both hands on the wheel for control. The fuel tank holds just 36 gallons, so the available time at wide-open throttle is limited, though it can be extended by twin optional auxiliary tanks, which hold 11 gallons each. Mercury is Bullet’s choice for motors and, in theory, one could power the 21SDC with more horsepower, such as Mercury Racing’s 300XS — a factory bored-out 3.2L version of the 250 Pro XS, which displaces 3.0L and also weighs 505 pounds. An out-there option is Mercury’s supercharged 400R, but it weighs 668 pounds, which could affect the boat’s excellent balance, starting with increased bowrise. By all reasonable yardsticks, the 250 Pro XS is the right engine for this boat. Besides, anyone dreaming about fishing in the big leagues will be restricted to no more than a 250 anyway — power that seemed to work out well for Bullet pro Andy Morgan, who won FLW Angler of the year in 2013 and 2014. Bullet will pre-rig for a Yamaha and let the dealer finish the job. During our test of the new 21SDC, we found out why the company is named Bullet. But while speed on a tournament bass boat is important, without stability it’s a recipe for disaster. The start of a tournament — even some club events — is chaos personified. It’s a drag race to the best fishing spots, and niggling details such as 100 boat wakes amplified by the wind won’t cause competitive anglers to let up on the throttle. 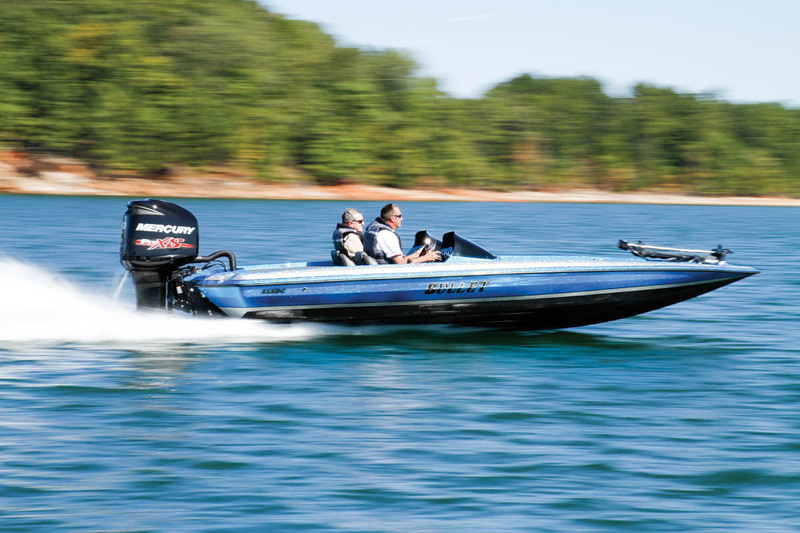 On test day on giant Lake Lanier, north of Atlanta, there was a brisk breeze to help test the Bullet’s rough-water ride. 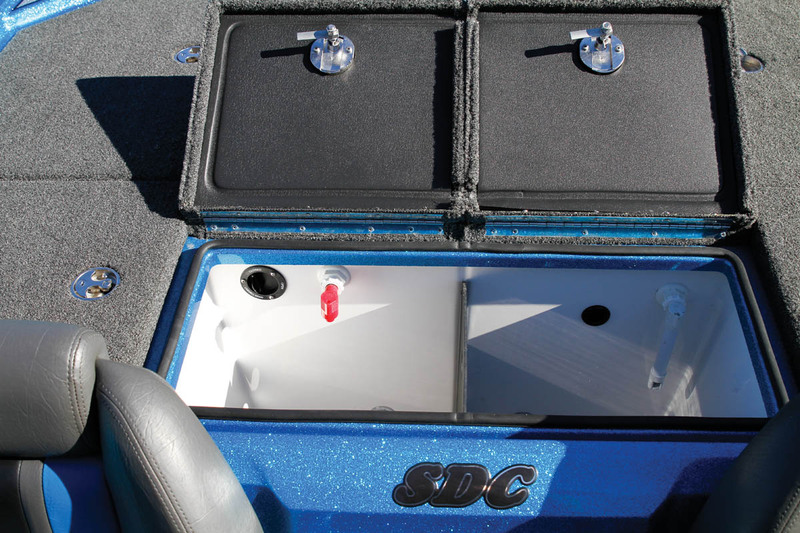 The 21SDC’s deadrise of 22 degrees is unusually deep for a bass boat and helped provide a surprisingly smooth ride with slicing action that was amplified by its narrow beam. This configuration felt a little spooky when we crossed a parallel boat wake at speed, because it does heel over more than some, but it remained easily controllable. The two SAS Quad-Spring seats helped smooth the ride in the chop, and I appreciated their uncluttered design that didn’t feature any weird protrusions toward the top. The rider in the center gets “jump-seated” on a less elaborate perch that flips down to form the step-up to the rear deck. The step-up to the front deck could serve as a fourth seat. In case it isn’t clear, the 21SDC isn’t a crappie boat. 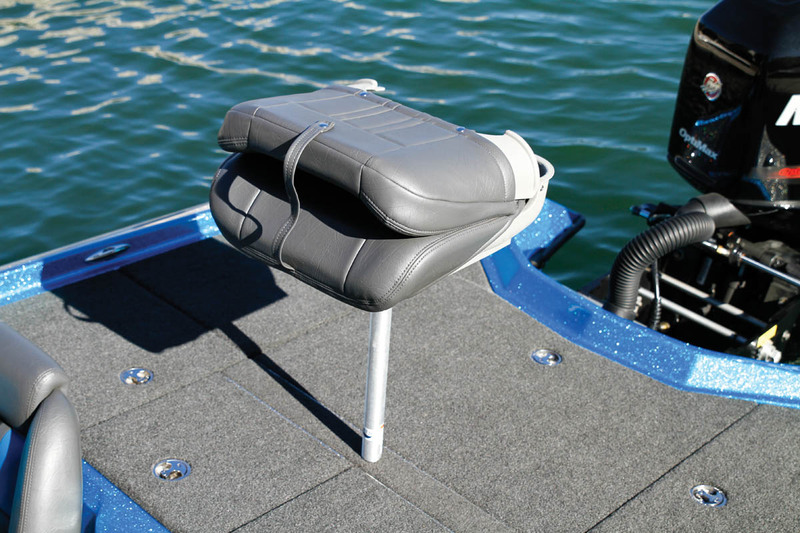 It’s designed for bass fishing, professionally, at the club level or during weekend excursions for personal glory. In the bow section, aka the primary angler’s office, there are three main storage compartments. The portside locker is the dedicated rod storage area with nine built-in tubes to protect fragile tips, but the center locker is voluminous and is extra-long, so it can also be used for rod storage or it can be loaded up with Plano tackle boxes like the one to starboard. The livewell has a double aerator system with a Flow-Rite air injector with two lids and a divider to keep potential culls separate and secure. 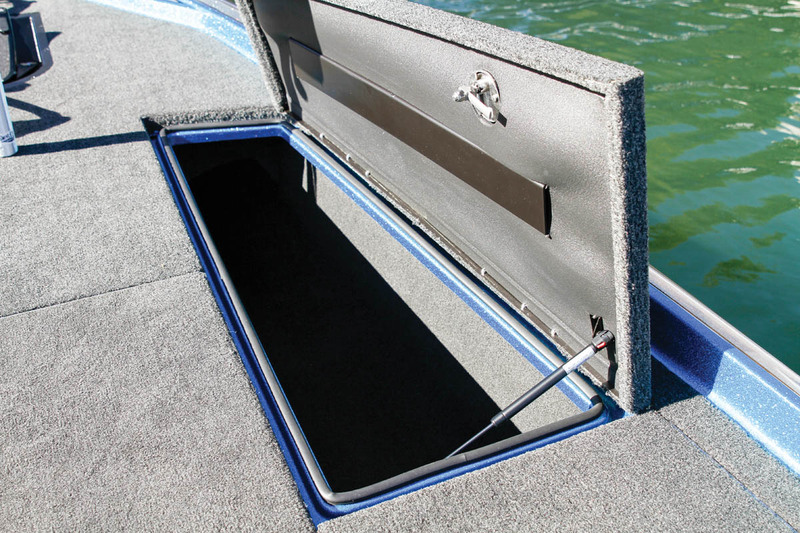 Being essentially a custom company, Bullet will trick out the boat to the buyer’s preference, including the placement of the trolling motor footwell. It will even let buyers choose the material they want the hull cored with: either standard balsa or composite. Bullet makes sure owners start with everything they need to go straight to the lake, including a custom Boatmate trailer, for $73,500. That price includes needed items such as a battery charger, hydraulic SeaStar Pro Steering, a Hydrodynamics Rapid hydraulic jack plate and a MotorGuide 24v trolling motor. Buyers get their choice of gel or flake in whatever color they want. 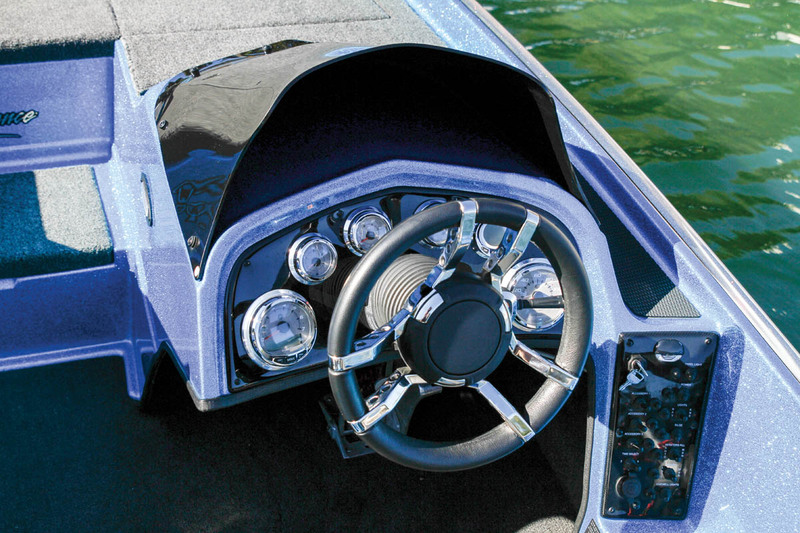 At the helm, Mercury SmartCraft gauges are standard, as is the upscale Gussi steering wheel. We’re a little surprised the padded foredeck was an option ($750), given the long days most bass anglers spend on the water. Lithium Pro batteries are a $3,000 option, including the charger. For fishing on shallow bodies of water, a pair of Power Poles ($4,500) is the preferred anchoring solution, for their speed and quietude. Purchased by Donnie Feagle, Lake City, Fla. Purchased at McDuffy Marine and Sporting Goods, Lake City, Fla. I added a metal plate to the floorboard in order to move the Hot Foot throttle pedal to a more ergonomically correct position. I like to fish in Open and Extreme Bass fishing tournaments in north central Florida, especially the ones on the Suwannee River where I do most of my fishing. I also organize a local tournament to raise money to fight breast cancer, which claimed my wife a few years ago (suwanneeawareness.com). I’ve had a boat since I was 17 and have owned many different brands, but the 21SDC is the best boat I’ve ever owned. I have it rigged with a Yamaha VMAX SHO 250 and it runs nearly 82 mph. I fished a tournament on Lake Okeechobee, and despite 2-foot waves I was able to run near 80 mph in comfort. McDuffy Marine’s service is fantastic. The service techs gave me their cellphone number, and I called them on a Sunday (their day off) and they talked me through a problem I had. LOA: 21 ft., 10 in.